My last post described how I made the flywheel hub for Jan Ridders’ simple LTD Stirling engine. It was pretty easy to make, which is good because I screwed up and now I have to make another one. The hub slides on to the crankshaft and is held in place with a set screw. The shaft is suppose to be 2.5 mm in diameter which is pretty close to 3/32-inch. But I drilled the hub’s center hole for 1/8-inch drill rod because that’s what I had on hand. I later realized that the slightly bigger shaft could cause problems when I make and assemble the crank webs and the graphite crankshaft bushings. It would probably work, but I don’t want to lead anyone down the wrong path. So I ordered some 3/32-inch drill rod and I am going to remake the hub. By the way, I like working with W-1 drill rod and I keep an assortment of different diameters on hand. It’s fairly inexpensive and manufactured to close tolerances for size, straightness, surface finish, and uniformity. Regular metal stock can sometimes be a little over or undersized, which can cause problems and extra work. But drill rod is ground and then polished to within .001-inch or better of its nominal size. It’s great if you need to make a shaft or a pin. You may be able to just buy the diameter you need, cut it to length, machine the ends and be good to go. It already comes with a nice finish on it and it doesn’t take a lot of work to polish it to an even shinier finish if you need one. It is also fairly resistance to rust. Drill rod is also known as tool steel and in the UK it is called silver rod. There are different kinds of drill rod but they are all tough, high-strength steels with good wear resistance and good machinability. There is something else about drill rod that makes it very useful. 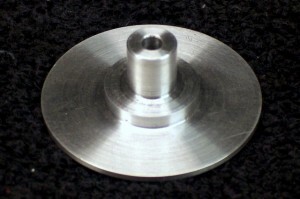 It is designed to be hardened, although it is often used without hardening. Drill rod is classified by the way it is cooled during the hardening process. I use W-1, which is the least expensive and it is hardened by heating it to a certain temperature and then cooled by plunging it into water. A-2 and D-2 are air hardened, O-1 is oil hardened and S-7 can be air or oil hardened. I’ve got one more thing to say about drill rod. Buy it from Enco if you are in the U.S. They seem to sell W-1 drill rod for less than anyone else. Not just a few cents less, but a lot less. Plus you can usually get it with free shipping. If you can find it for less elsewhere please let me know.